When Romeo Corvaglia was finally able to lift up the trophy, all of the corvaglia employees in attend-ance were overjoyed. The corvaglia group won this year’s prestigious Prix SVC Ostschweiz. 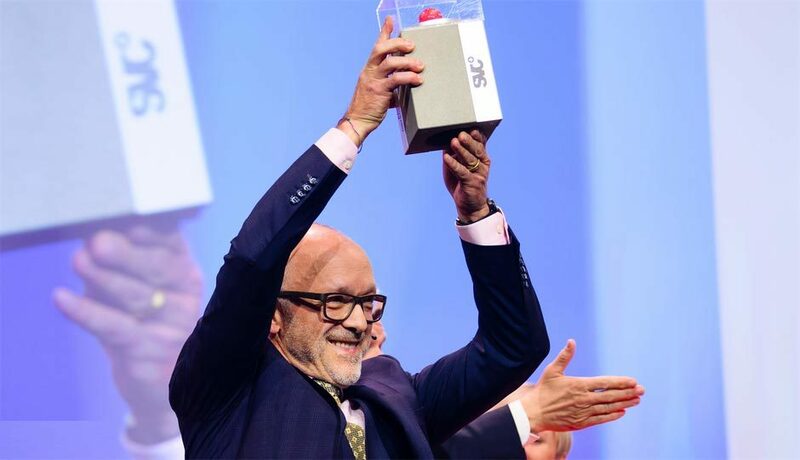 Thomas Zellweger, the president of the jury, said in his congratulatory speech: “Romeo Corvaglia has built a company up from scratch that has simply amazed our jury.” He also said that the jury was im-pressed by the synergy within the company between the founder – a fully committed visionary – and the management team which continues to evolve and grow. In his acceptance speech, Romeo Corvaglia said: “I am incredibly proud to have the honour of accept-ing the Prix SVC Ostschweiz on behalf of everyone at corvaglia. Congratulations, dear colleagues. This prize is for you.” He said that he looks back over the last 27 years with great satisfaction. His proudest moment, however, was his decision to hand over the reins of the company at just the right time. This decision allowed him to see how, just three years later, his management team and all of the employ-ees, under the leadership of Dr Michael Krueger, were able not only to absorb his vision for the com-pany, but to successfully continue on its legacy. In fact, this success is primarily down to a team of 275 employees based in locations around the world who use their expertise and passion to create closure solutions for PET bottles that have set new standards time and again. The Prix SVC was received with enthusiasm and will serve as additional moti-vation for corvaglia to achieve its ambitious goals going forward. The elegant and exciting award ceremony took place at Olma Messen St. Gallen in front of more than 1,000 guests from the fields of business, politics, science and culture. The corvaglia group would like to congratulate the other finalists – all impressive and successful com-panies – on their success: Büchi Labortechnik AG, HB-Therm AG, MS Direct Group AG, Namics AG and Uffer AG.